High cylinder pressures are generated with the use of these kits;forged internals are Mandatory ! 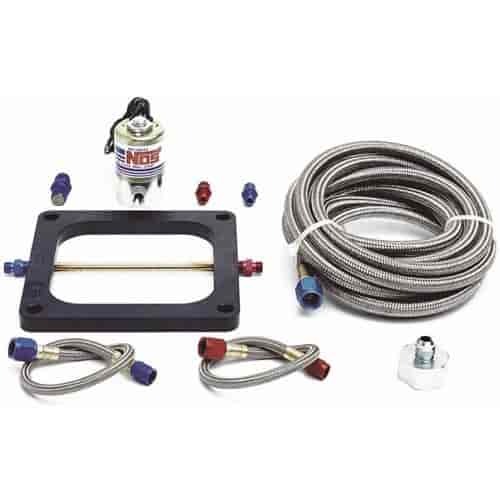 NOS Cheater systems are designed for use on 350 ci or larger carbureted engines. Large nitrous and fuel solenoids are adjustable for an increase of anywhere between 150 to 250 horsepower. Cheater systems utilize a thin 1/2-inch injector plate between the carburetor and intake manifold offering efficient nitrous distribution while still providing under-hood clearance. Cheater systems include a 10 lb. nitrous bottle, four (4) stages of jets, aircraft-quality steel braided line and all other necessary electrical and mounting hardware for a complete nitrous system installation.